Written by locals, Fodor's Alaska is the perfect guidebook for those looking for insider tips to make the most out their visit. Complete with detailed maps and concise descriptions, this Alaska travel guide will help you plan your trip with ease. There's no denying that Alaska is... read full description below. Written by locals, Fodor's Alaska is the perfect guidebook for those looking for insider tips to make the most out their visit. 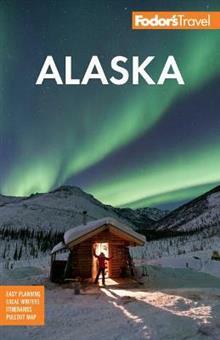 Complete with detailed maps and concise descriptions, this Alaska travel guide will help you plan your trip with ease. There's no denying that Alaska is a trip of a lifetime. Nowhere else can you kayak to glaciers; fly over the highest peak in North America; wonder at the Aurora Borealis; stay out all night celebrating the midnight sun; visit quirky towns; spot bears, eagles, moose, and whales; and learn the true meaning of the word remote -all in the same trip. Fodor's Alaska makes it easy to create a perfect trip from start to finish. Fodor's Alaska includes: *UP-TO-DATE COVERAGE: Fully updated information on new openings and developments; including restaurants, hotels, and outdoor activities, for all of Alaska's top destinations and undiscovered gems, from cities such as Juneau and Ketchikan to Denali National Park and the Kenai Peninsula. *ULTIMATE EXPERIENCES GUIDE: A spectacular color photo guide highlights the ultimate unmissable experiences and attractions throughout Alaska to inspire you. *PULLOUT MAP AND DETAILED MAPS: A handy PULLOUT map, which includes an outdoor activity finder, will help you navigate on the go. Full-color and full-size street maps throughout will help you plan efficiently and get around confidently. *GORGEOUS PHOTOS AND ILLUSTRATED FEATURES: Rich full-color features invite you to experience the best of Alaska, from what to eat and drink to which cruise route to take. Other magazine-style features help you understand everything that Alaska has to offer, from whale watching and bear sighting to shopping for Alaskan native crafts and learning about the Klondike Gold Rush. *HELPFUL ITINERARIES AND TOP RECOMMENDATIONS: Day-by-day itineraries help you plan and make the most of your time, including carefully chosen recommendations for the best sights, stores, restaurants, hotels, nightspots, and activities. Fodor's Choice designates our best picks in every category. *INDISPENSABLE TRIP PLANNING TOOLS: Each region has a convenient overview with highlights and practical advice for getting around. Best Bets lists ensure you find the right spot for your needs. *COVERS: Juneau, Denali National Park, Anchorage, Fairbanks, the Kenai Peninsula, Skagway, Ketchikan, Glacier Bay, Haines, Homer, Kodiak Island, the Yukon, and more. ABOUT FODOR'S AUTHORS: Each Fodor's Travel Guide is researched and written by local experts. Fodor's travel guides have been offering expert advice for all tastes and budgets for over 80 years. Looking for a guide about Alaska cruising? Check out Fodor's Complete Guide to Alaska Cruises.